The Easter bank holiday is nearly upon us, which is perfect timing as a short spell of glorious sunshine has just arrived too. Is that the beer garden calling? I think so. But amidst the sunshine and three-day weekend is the big event itself; Easter Sunday. Although he majority of us don't still partake in Lent in its traditional form, we all still love to celebrate the big E with lots (and lots) of chocolate. And who else does chocolate on the high street better than Hotel Chocolat? Boasting luxuriously smooth chocolate products, catering to a wide range of palettes yet never compromising on taste by ensuring all products are jam-packed full of the finest cocoa beans. And all of these products featured in the post are available to buy at the Merry Hill branch of Hotel Chocolat (Upper Mall, opposite Marks & Spencer) - I checked online! And FYI, make sure you pop in-store before the big day itself because Merry Hill is closed on Easter Sunday. (Also, why not play a game of 'spot the egg pun' whilst reading this? A lot of folk forget about all the little chocolate nibbles Hotel Chocolat do- like these adorable pocket money friendly bites. 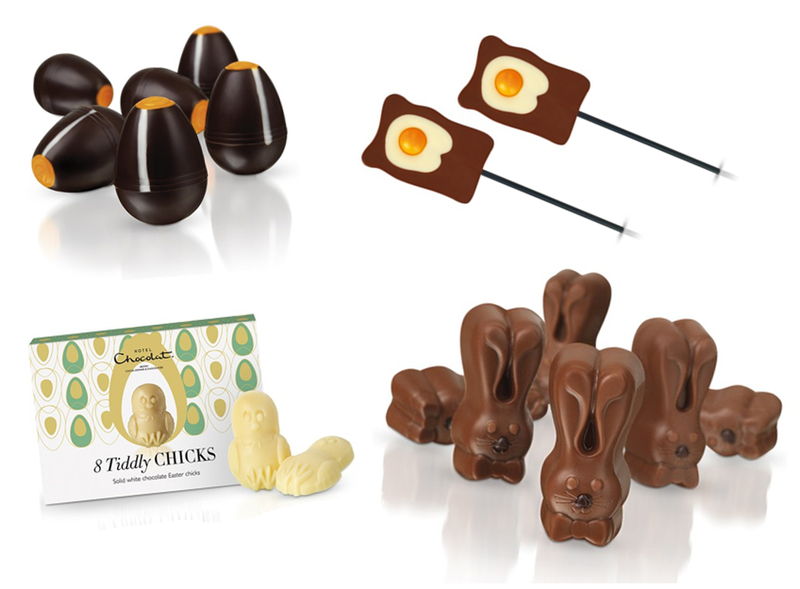 Fried eggs on toast and caramel bunnies make an unusual gift for kids (or big kids, obviously too) and the Mandarin Olive Oil Egglets would be perfect for chocolate aficionados with a more mature palette. One of many things to love about Hotel Chocolat is their creativity and originality. I mean- look at these adorable fried egg & chip shaped cocoa delicacies- a real tongue in cheek approach to the humble easter egg. The eggs and soldiers 'cracked' me up too - I haven't eggs'n'toast in years but I'll probably just go out and buy a packet of these instead because 1. they look tastier and 2. I'm lazy and rubbish at cooking hard boiled eggs. Never have splattered foods looked so appealing! 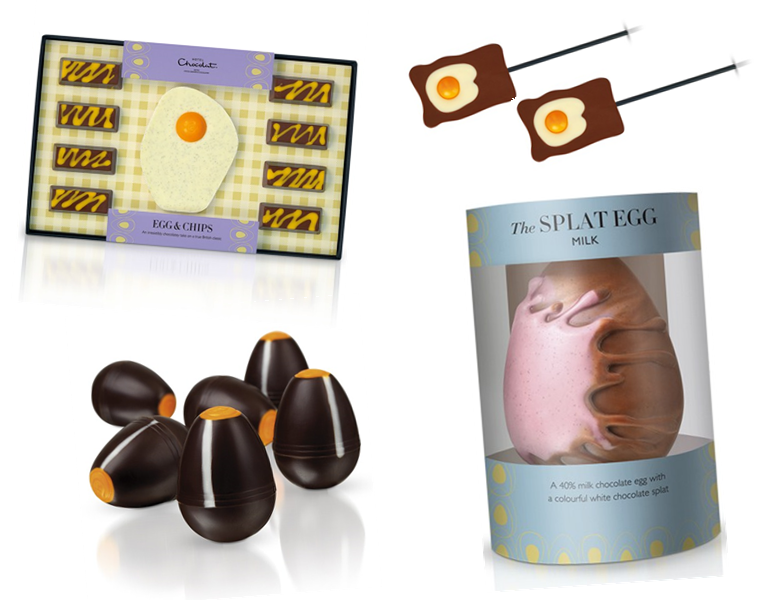 If you're bored of the same old, smooth and glossy easter eggs, the Splat egg is perfect for chocolate anarchists like yourself. Firstly, I LOVE the names of these eggs. So many puns. 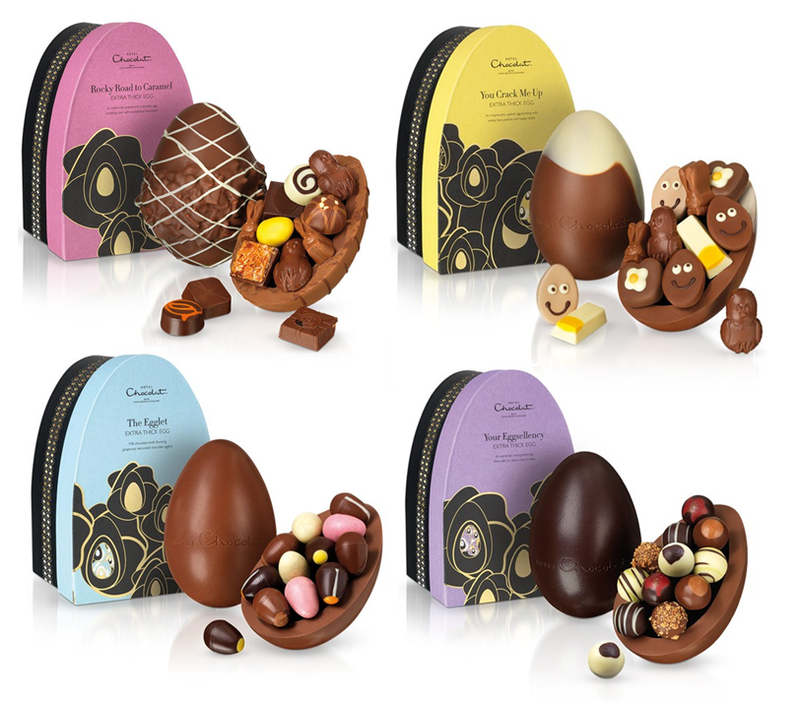 These are a total luxury treat for Easter;the big daddy egg of all eggs. Encased within an extra thick easter egg is a small selection of truffles, caramels and small chocolates...which totally beats any hollow egg in my opinion. Perfect gift for that 'egg-xtra' special someone. 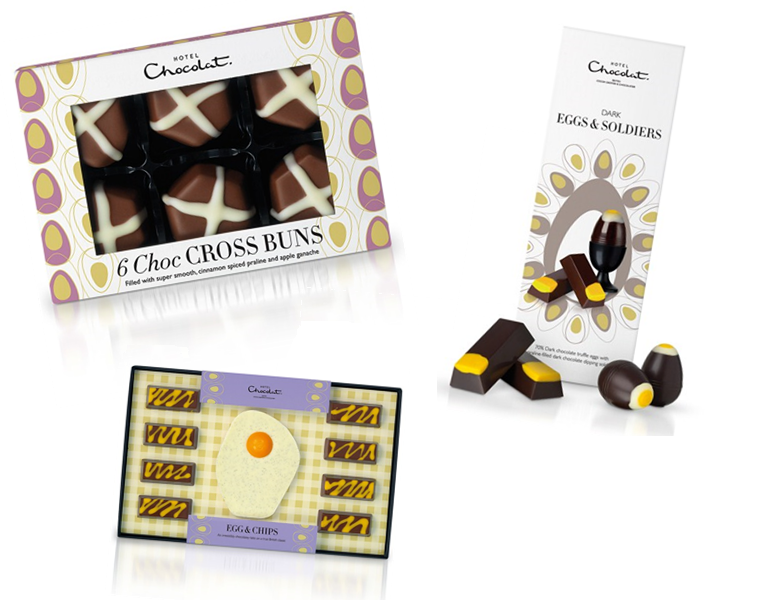 If you really want to go all out, why not bag yourself one of these 'egg-cellent' bumper hamper? Great idea for big family gettogethers over the Easter bank holiday. Sharing is caring after all. And the sharing is so much better when it involves tasty Hotel Chocolat treats.